Garden #1: My co-op's p-patch. A 10' x 20' plot in the local community garden that we grow vegetables in. Garden #2: Our yard. Not suitable for growing vegetables because of harmful chemicals in the soil (arsenic and lead). I am using this as my training grounds for ornamentals. Garden #3: The youth gardening program that I volunteer with, which produces like a small farm and sells at the local farmer's market. Garden #4: The raised veggie bed we created at work, for the pleasure and education of the youth I work with as well as for myself. 1) The soil at work is--like the soil in my yard--contaminated, so I decided to make a raised bed that is tall enough to keep the plant roots from digging down to the contaminated soil. Two feet is a safe bet. 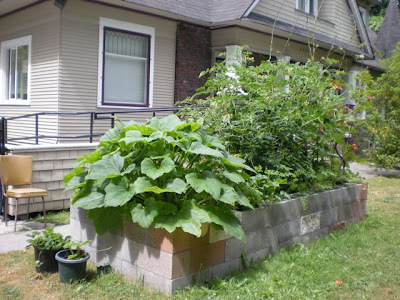 2) I used cinder blocks because they will last considerably longer in the ground than anything made of lumber, even treated lumber, though of course you're not supposed to use treated lumber for a veggie bed. People don't think of concrete as a "green" material, but if you ask me, gray is the new green. 3) A cinder block bed is actually cheaper than a comparable one made of wood. And, since I had a big work truck I could use to transport them, I didn't have to pay for delivery (which would otherwise be an added cost that might not factor into a wooden bed). I imported a yard and a half of topsoil (enviro-mix from Pacific Topsoils) and roughly 3/4 yard of compost. We planted squash, beets, an artichoke, a cucumber, dill, cilantro, basil, tomatoes, lettuce, and beans. We also planted the border--the voids in the cinder blocks--with radishes, carrots, beets, nasturtium and marigolds. Everything has grown abundantly, but it's our tomatoes that stand--quite literally--head and shoulders above all others I've seen. I stood up on the edge of the bed a couple days ago and they were up to my chin. I am not a short person. They are laden with yellow flowers and green fruits. The beans have twined up into them and have bound numerous stems to the bean poles, making additional stakes for the tomatoes unnecessary. Our basil was also--for some time--quite a bit more impressive than any other I saw around, especially during the initial, cool part of the summer. Others have since caught up, but ours is still going strong. 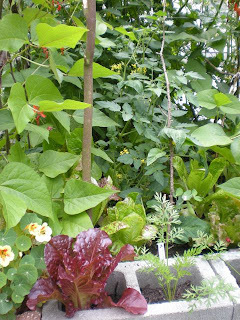 I think all the plants are happy in the rich, new soil, but the particular success of the heat-loving plants, I think, is due to the bed design. With two feet of concrete exposed to the sun--getting it on three sides over the course of the day--the cinder blocks get very warm, and that heat is transferred into the soil. Come night-time, the cinder blocks retain that heat for a while (stone and concrete have high "thermal mass", which means they retain their temperature, whether it be heat or cold...this may not be so great come winter time). The centers of the blocks are packed with soil, which adds insulation inside the concrete. The one thing I would do differently in making a bed like this again is mortar the blocks together. Right now the blocks are dry-stacked. Though they'e heavy enough that they do not move easily, over time they will probably get a bit dishevelled, especially if whoever cultivates the bed is not careful to avoid knocking the blocks when turning the soil. 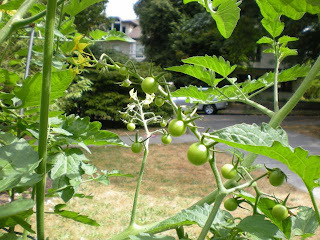 But other than that, I think I stumbled upon a really good idea for how to grow heat-loving summer veggies in Seattle. is that courgettes in the top picture? they're massive, like mine :). My squash are threatening to take over the garden. and you're really keeping chickens...? yes, chickens indeed. and what are courgettes? it's some kind of squash...two plants that have merged, actually.